Warden Vogel is the warden of the Cookieville Minimum-Security Orphanarium. He has been a bureaucrat for the last 25 years, and is currently in the 135 grade. 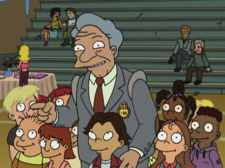 He was the father figure to such orphans as Turanga Leela and Adlai Atkins. He still runs the orphanarium and takes care of lonely kids whilst trying to persuade people to adopt them so they can have a better home. His financial status is not much better than that of his orphans. His last name is the German and Dutch word for bird. In all his previous appearances, he spoke in a clear American accent. However, in "Yo Leela Leela", David Herman gave him a slight Irish brogue. Warden Vogel: Leela! You're worthless and no one will ever love you! Warden Vogel: Those were happier times. Warden Vogel: Would you like some dirt on any other orphans? This one drinks out of the toilet. And this one was conceived when a sperm bank truck crashed into an egg donation clinic. Warden Vogel: Come on, kids! You can slide around the gym in your socks. This page was last edited on 5 January 2014, at 05:19.